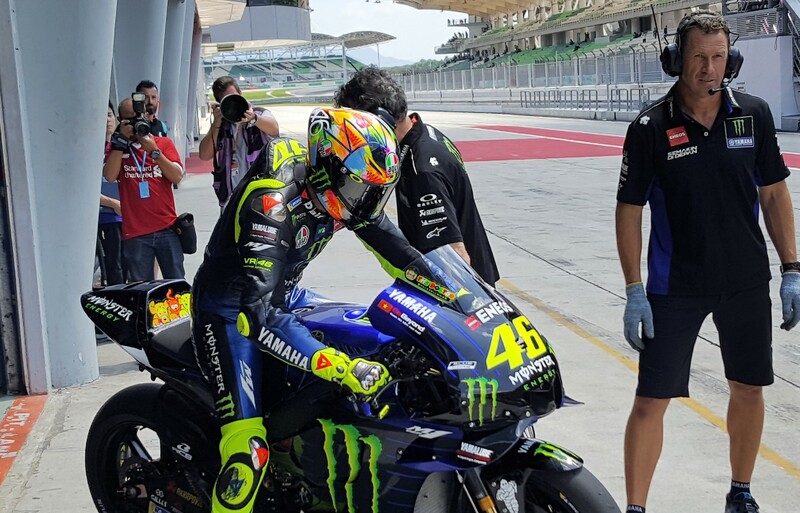 Valentino Rossi unveils special helmet design at start of 2019 MotoGP testing. This is the special helmet design that Valentino Rossi will use for 2019 pre-season testing, which began at Sepang on Wednesday. "In Sepang I will have a new helmet, designed with Aldo Drudi that I will use for the tests this year, which is very interesting, you will see but it is something new. Very artistic. I think that it's very cool." After unveiling the helmet, Rossi said: "As for every season’s tests, I made a special helmet for this year as well. It’s always a great experience to work on a special edition. We try to find new ideas every time, but it’s not always easy. "For this year’s helmet, we had a hard time making up our minds, but at some point I looked at Aldo and I asked him to do something for me - to do what we used to do, pick up a paintbrush and draw the helmet freehand, like in years past. And that’s what we did! However it will not be used once the world championship gets underway in Qatar next month: "The helmet for the racing season will remain very similar to the helmet of last year. Maybe some small modifications, but very similar; blue and yellow."